Coming in a range of species or varieties as well as lots of new and rare cultivars Canna Lilies are available for sale in Australia. From the taller varieties that can reach 2m in height to smaller growing types that will reach around .5m, they are a versatile plant that suit many landscaping situations. Species include canna generalis, gluaca, indica, tuerckeimii and variegated canna as well as dwarf and water loving varieties. The brilliant flowers of cannas (see picture right) and colorful foliage are the signatures of these useful garden plants. A long flowering season from spring to summer is an advantage. Canna tropicanna is a colorful foliage plant with great dark red foliage veined with crimson and attractive yellow flowers. Most varieties are grown both for flowers and foliage. Canna Lilies prefer a position in full sun in a well drained soil rich with humus and well rotted compost. Rotted cow manure is a great fertilizer. Mulch well to retain moisture. Cannas can be cut back to 2 – 3 cm from the ground at the end of the flowering season (making sure to leave the new shoots alone as these will be next years flowers. After the flowers fade, they can be dead headed just below the spent flower. Pale and white flowering varieties are best shaded from the hot afternoon sun. Cannas can make great foliage plants, and can look great in front of a wall or fence, or at the back of the border. Divide every 3-4 years to promote flowering and keep healthy. Plant cannas from winter through to early spring. With a few very hot spells over the past few years we have had a few questions about growing canna lilies in full sun. We have seen photographs of brown and scorched foliage. Leaf scorch from very hot sun. The leaves and stems will turn brown and shrivel up. This is particularly a problem if the plants are facing the west. The solution is to shift them, however, some shade cloth draped over them on those 40 degree days can also help. During hot weather, especially hot windy weather the soil dries out very quickly, so water well in the evening as soon as the sun goes off the plants. Canna Lily Bulbs and plants for sale online. 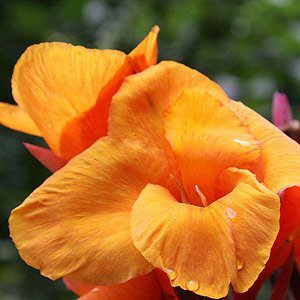 Hybridizer of cannas and begonias…have been hybridizing begonias for over 30 years.